This review first appeared in the May 14, 2003 issue of Fahrenheit San Diego. Techno? Trance? 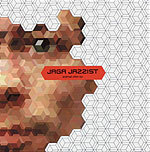 Think Tangerine Dream updated by about thirty years and you've got a pretty solid handle on Jaga Jazzist. The 10-piece combo out of Norway features lots of synthesizers and oh-so-cool ultra-dark shades hipster attitude. Just not much meat on the bones musically. In fact, their new 7-song EP doesn't really get interesting until the urban ambience of the closing track, the 16-minute "Toxic Dart"  a couple talking/arguing in Norwegian while schlepping around in the kitchen with a slowly building buzz on acoustic guitar and synths. Like a modern update of Pink Floyd's "Alan's Psychedelic Breakfast," house-style and without the snap of frying bacon in the background.